The Friars of Sports Illustrated. It’s no secret that the Padres go under the radar in regards to national press. While some take issue with this and are quick to call out the “East Coast Bias,” or something else along those lines, I could care less. Even when they do make the postseason, the Padres are generally viewed as “meh.” Which, from an objective stance, I understand due to the history of the organization and the city they represent. With all this said, you have to admit that when the Padres do get recognition by the larger media outlets, it’s usually pretty cool and memorable. The exception to this, of course, was dealing with the deaths of Tony Gwynn and Jerry Coleman last year. I think we can all agree that as Padres, this is media recognition that everyone could have done with out due to the heartbreaking nature of it all. 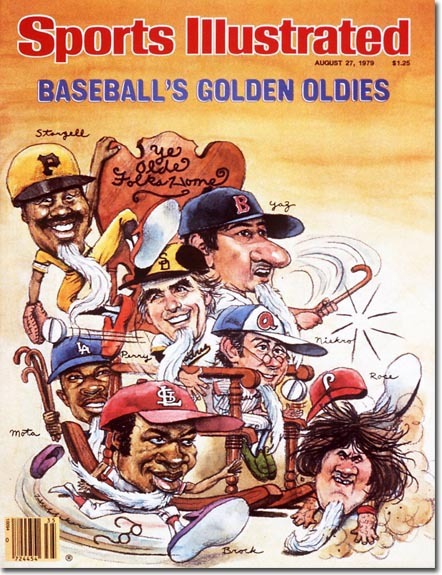 Sports Illustrated is one of the biggest sports publications out there and years ago, I realized a fair amount of Padres had graced the cover of the iconic magazine. In 2010, I decided to create a post on 90 Feet of Perfection with some of these covers. When I realized it wasn’t appropriate for the site, I deleted the post. Oh yeah, I can’t fail to mention that it also sucked and was incomplete, so yeah it had to go. Well, when I created The 5.5 Hole, I thought it would be cool to do it again and right. So here is (as far as I know), every Padre featured on the cover of SI. I hope you enjoy these gems. 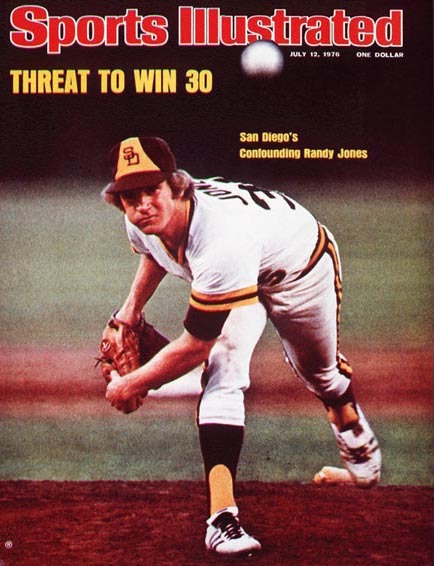 After coming in second to Tom Seaver in Cy Young voting in 1975, Randy Jones was honored with the prestigious pitching award in 1976. Sports Illustrated took notice of the season he was having and gave him the cover in July. Their headline surely jinxed his chances at 30 games though. Speaking of, Jones ended up finishing with a 22-14 record that season. If the Padres were any good (they finished 5th in the West), Jones would have most likely won 30 games. Even though wins are kind of a lame stat, that would of been a cool accomplishment for Jones and the Padres. 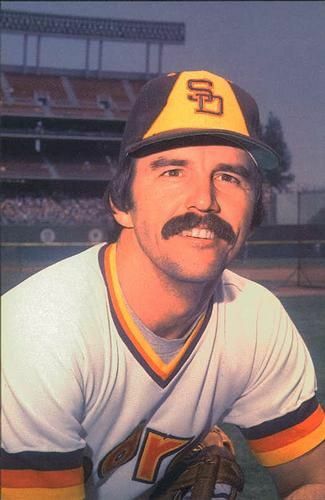 Prior to the 1978 season, the Padres acquired the old spitballer, Gaylord Perry. At 39 years old, he went on to win the Cy Young award and place 8th in MVP voting. The following season, at now 40 year old, he was having another hell of a season, and Sports Illustrated acknowledged this by lumping him in with various other aging baseball stars. 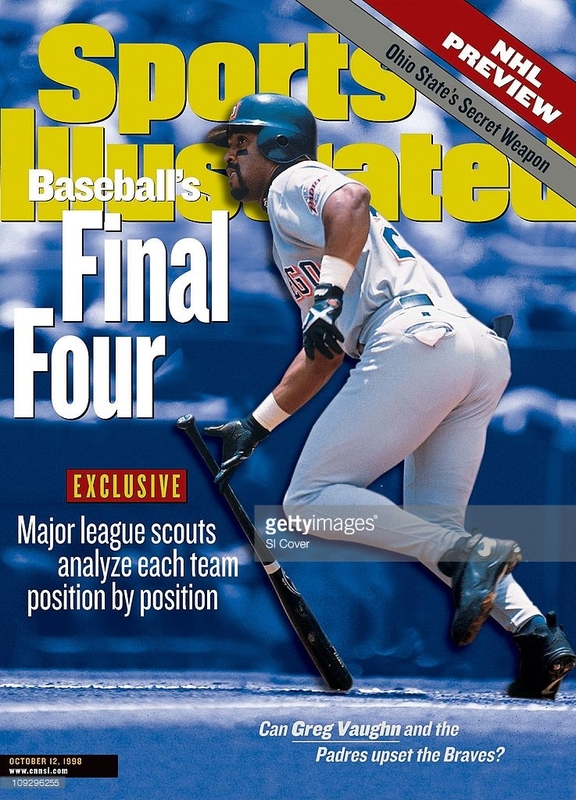 Unfortunately, Perry’s time in San Diego didn’t end well though, as he quit the team less than 10 days after this issue came out (another SI jinx?). He threatened to retire if the team didn’t trade him back to the Rangers, which they did in the offseason. I understand that he was sick of losing and was butting heads with management, but that was a douchey move on his part. 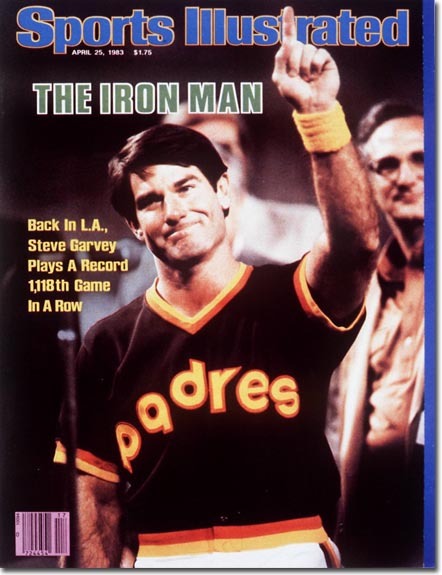 The Padres signed former Dodgers star Steve Garvey prior to the 1983 season and with that, he carried over his consecutive games played streak. Sports Illustrated honored Garvey and his streak by giving him the cover in April, however in July Garvey broke his thumb in a home plate collision against the Braves. This lead to the him going on the DL and ended his streak. If you ask me, this sounds like another SI Padres cover jinx. 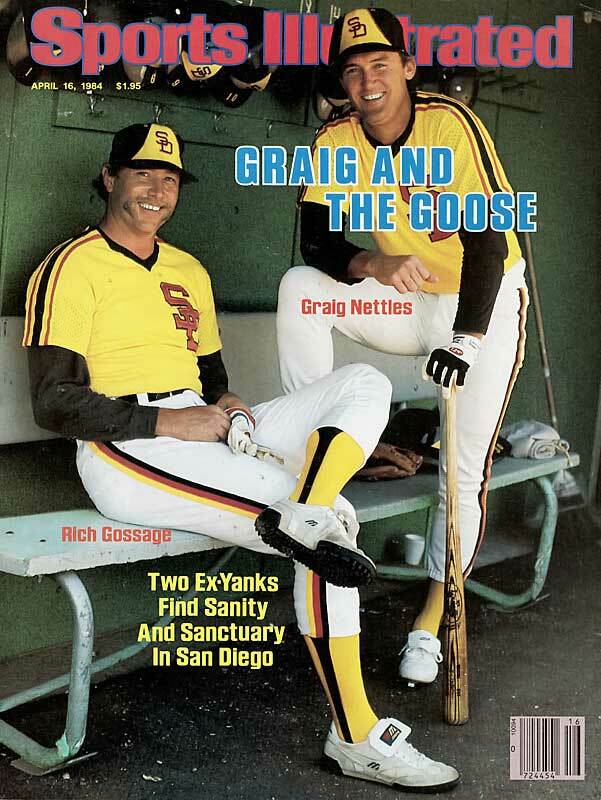 In what may be my favorite Padres Sports Illustrated cover, former Yankee stars turned Padre stars Goose Gossage and Graig Nettles were featured early on the cover in the 1984 season. I’ve never read the article that accompanied the cover, but would love to check it out sometime. Anything related to the 1984 season fascinates me and I wish I was old enough to of been able to experience it. 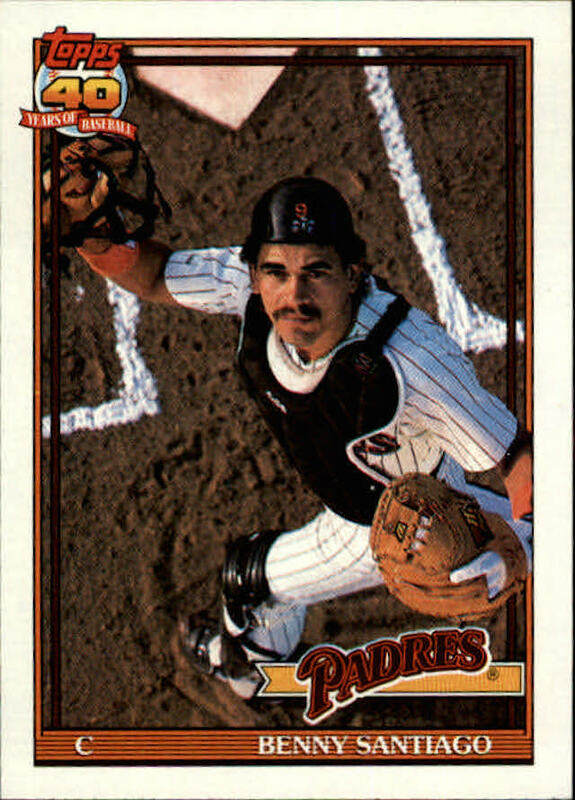 If you were a Padres fan in the late 80s/early 90s, Benito Santiago very well could have been your favorite player behind Tony Gwynn. 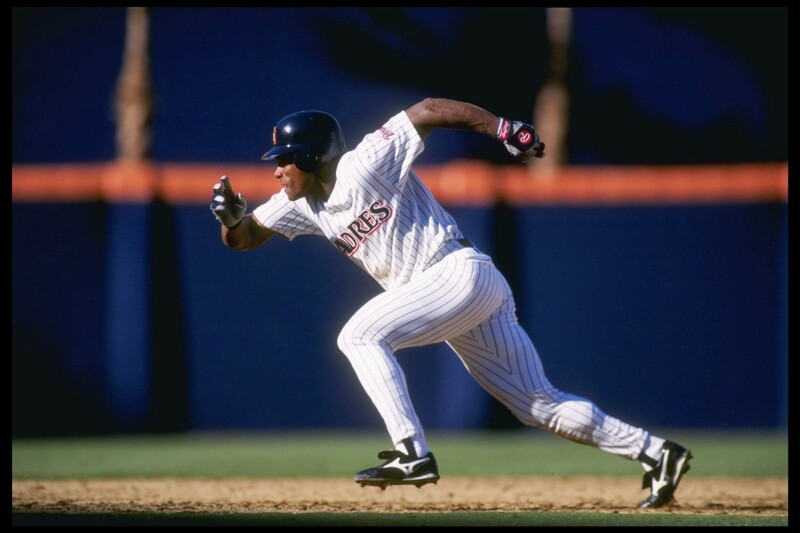 I’m pretty sure he had to be mine at some point due to a being a rookie of the the year, 4 all-star appearances, 4 silver slugger awards and 3 gold gloves. Maybe it had nothing to do with any of the awards though, and it was probably based solely on the fact that he threw guys out from his knees. This blew mind mind as a kid and even more now, due to the fact that I now catch from time to time. 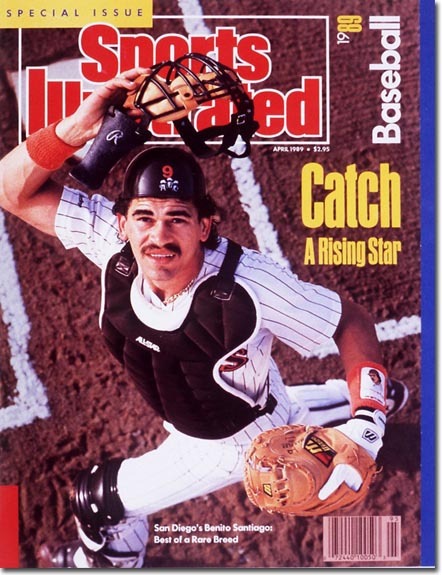 Sports Illustrated took note of San Diego’s rising star and featured him on the cover of the special “1989 Baseball” issue that coincided with the start of the regular season. 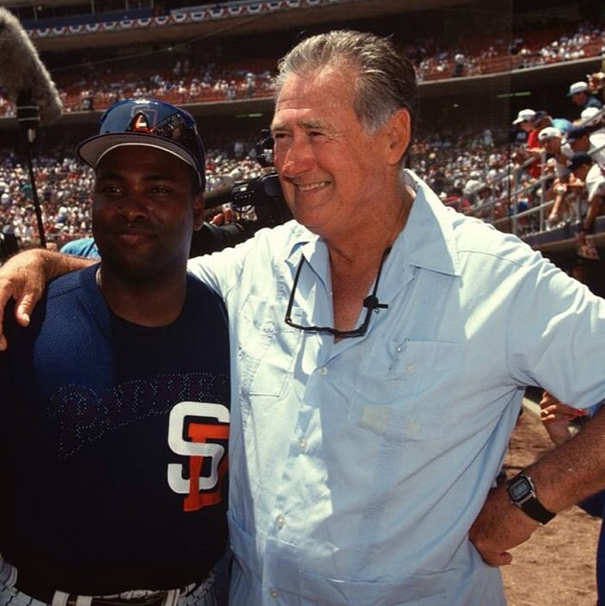 This is a great shot, but it strikes me odd that Santiago got a cover before Gwynn ever did. Also, I’m pretty sure a photo from the same shoot was used for his 1991 Topps card. 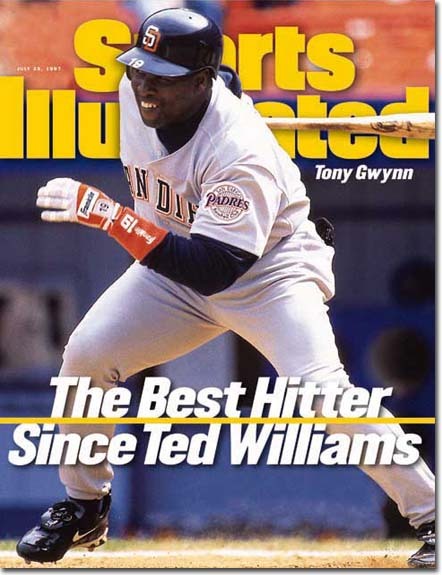 After 16 seasons in the big leagues, Tony Gwynn was finally given a Sports Illustrated cover and boy was it awesome. Anytime you compare someone to Ted Williams, it’s going to garner attention and this cover boldly said, without question that Tony was “The Best Hitter Since Ted Williams.” I own this issue and will never get rid of it. 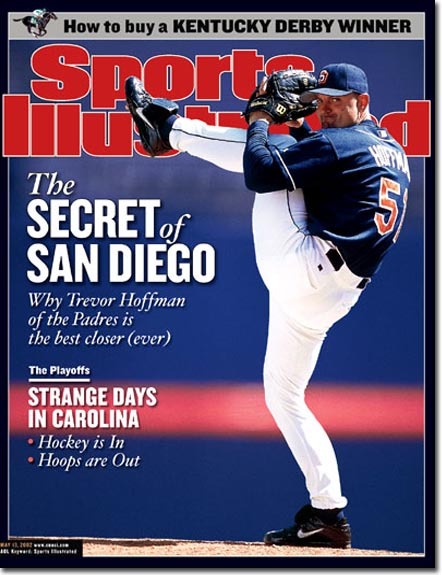 In 2002, Sports Illustrated was somehow convinced that Trevor Hoffman was the best closer ever and gave him a cover. Hey, I loved Trevor as much as the next guy, but to say he’s the best closer ever is silly, even in 2002, before both his and Mariano Rivera‘s legacies were not entirely solidified yet. I come from the frame of mind where I take modern closers with a grain of salt and think they pale in comparison to those of the past. Still, Hoffman was great and this photo is incredible. 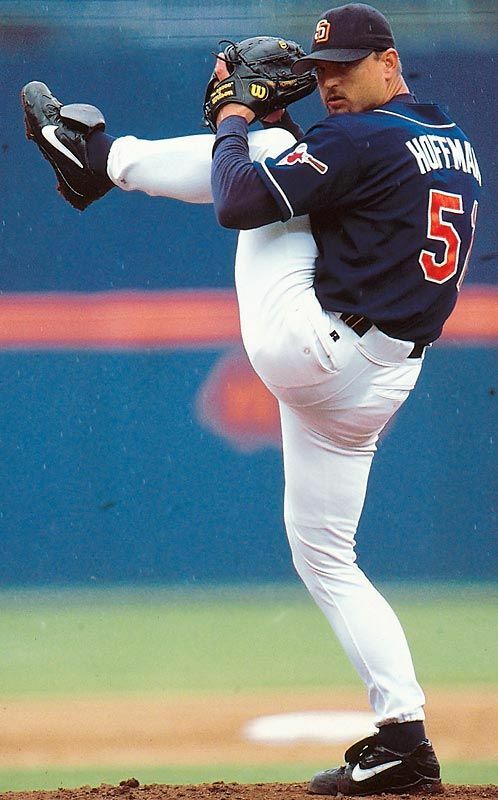 Hoffman’s leg kick still blows my mind all these years later. 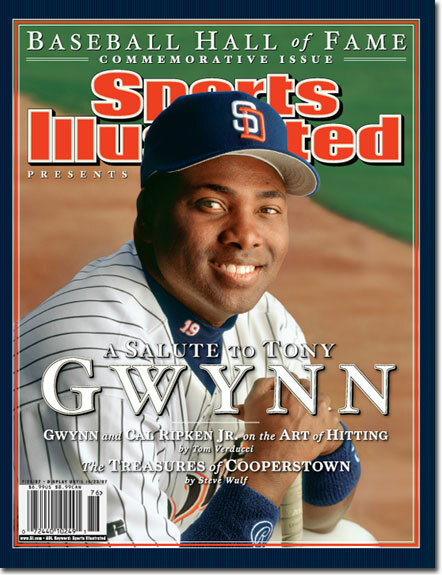 In 2007, Sports Illustrated published a Baseball Hall of Fame commemorative issue with covers featuring both Tony Gwynn and Cal Ripken, Jr. I’ve never got my hands on the Gwynn issue, but I will one of these days. An article by Tom Verducci entitled “Gwynn and Cal Ripken Jr on the Art of Hitting” is something that I need to read. 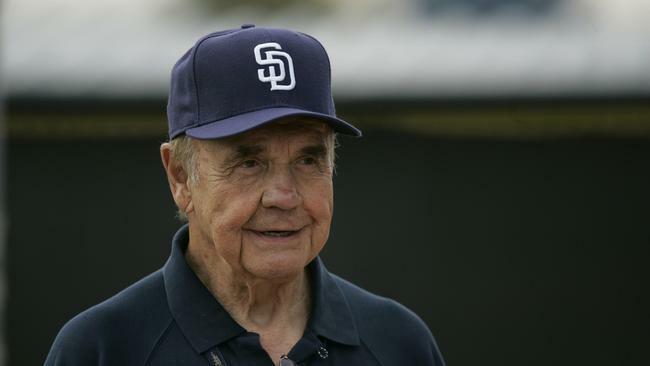 You can file this under mainstream media coverage of the Padres that we could all do without. As we all know, the Padres were not immune to PED drama, as the late Ken Caminiti was potentially the first MLB player to openly discuss the growing steroid problem in the game. 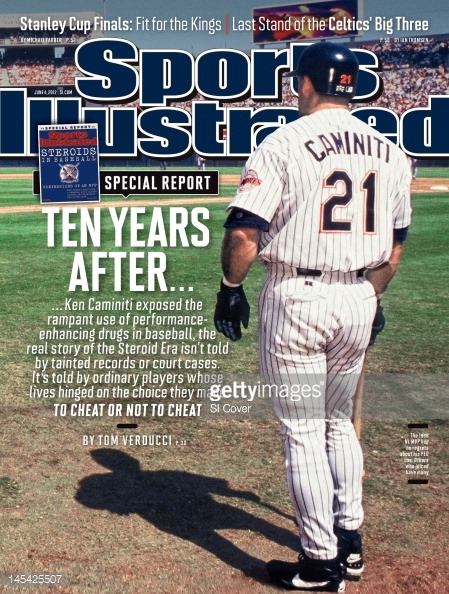 He did so back in a 2002 issue of Sports Illustrated (read HERE) and in 2012, they revisited the issue, which featured a cover with Caminiti in his Padres uniform. I’ve always felt that it’s a haunting image that stays with you after looking at it. 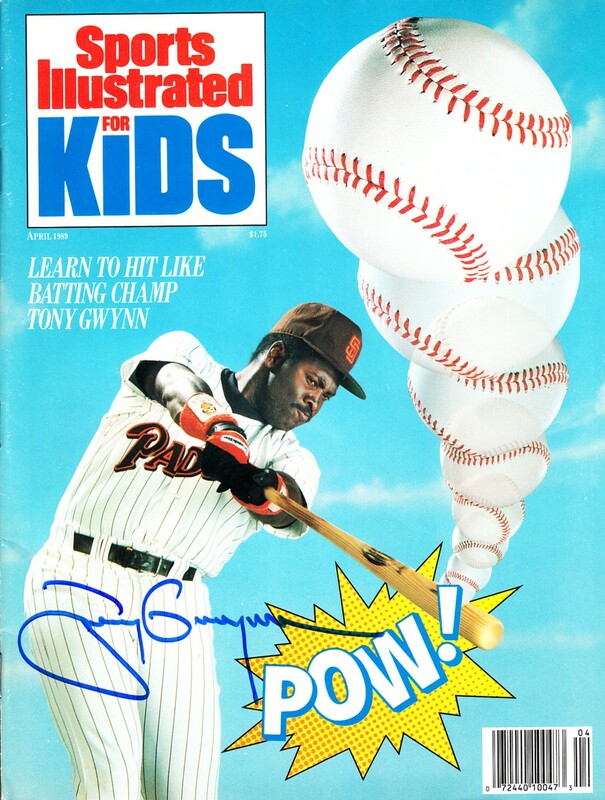 And for an honorable mention, I present Tony Gwynn’s cover of Sports Illustrated for Kids. 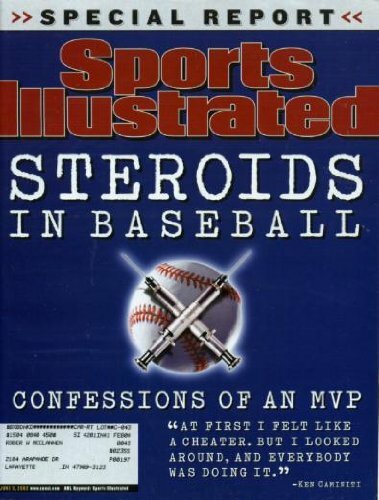 I had a subscription to SI for Kids when I was a little boy but never had his issue, which is weird because I swear I had a subscription for the first year of the publication. It’s too bad I never owned this, as I would have been SO stoked on it. Honestly, I’d still love to read the his article in it.